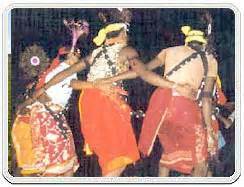 Grida dance of Madhya Pradesh: Grida is a form of folk dance that is performed in the state of Madhya Pradesh in India. This dance is an integral part of Madhya Pradesh and allows the people to enjoy by celebrating their joyous .The dance is performed in many of the villages in India. The occasion when the dance is performed is when the Rabi crop is ready for harvesting. All the villagers come together to enjoy the movement of life and perform the Grida dance. The joy of the villagers knows no bounds because their hard work has been paid successfully. The dance and celebrations continue throughout the day. The dancing program continues till dusk, which begins at day break. Every year, one of the villages plays the host for the event and the groups of villages performing together take turns to hold the event annually, playing the host. The village that hosts the event invites other villages in advance to prepare and participate in the performance of the Grida Dance. Every success needs to have a celebration. Like on the successful harvesting of the crops the people in India enjoy this success with the special kind of traditional dance. This 123help.com info is one of the appreciated acts that they are enjoying fully after their hard work.